Nothing will ruin a camping trip quicker than having a bad experience towing a trailer. Nine out of ten times, the reason you have a bad experience is because there is a problem with the tow vehicle or the trailer. It could be a weight problem. Mark Polk has been an expert witness in a few legal cases, where people were paralyzed and killed. The common factor in these cases involved improperly matched tow vehicles and trailers. Don’t depend on automobile dealerships and RV dealerships to always give you 100% accurate information. Do your homework before purchasing a tow vehicle and trailer The trailer might be too heavy for the tow vehicle or maybe you are exceeding a weight rating which can be extremely dangerous. It could be a problem with the hitch work. It might not be adjusted properly, or maybe you weren’t informed on the proper hitch work for your needs. It could be that you’re just nervous because this is all new to you. You aren’t really sure about how to tow a 30-foot trailer, or what is going to happen the first time you have to back the trailer in at the campground. Just the thought of towing a thirty foot long, three ton trailer down the Interstate can be somewhat intimidating, not to mention dangerous if it’s not done properly. The last thing we want to do is to put our family in harms way. So, whether you have already purchased an RV, or you are thinking about it, this video will teach you every thing you need to know before you tow. The host of the video Mark Polk has dealt with these types of concerns over and over again when he was a sales manager for an RV dealership. He felt that a video was the perfect way to address the RV consumers concerns. With this kind of thorough visual training, you can now relax and watch the video as many times as it takes to address all of your questions and concerns. With charts and easy to understand hands on instruction this video starts by teaching you how to properly match the tow vehicle and trailer. It discusses all of the weight ratings involved for the trailer and tow vehicle. Did you know that any weight you add to the tow vehicle takes that same amount of weight off of the tow vehicle rating, to include the weight of passengers? Do you know what the Gross Combined Weight Rating (GCWR) is for your tow vehicle? You will after watching the video. Now that you understand all of the weight issues the next step is to learn what hitch work is required to safely and properly tow your trailer. Did you know that you could have a tow rating of 7,500 pounds but if the hitch receiver on your tow vehicle is rated for 5,000 pounds that is the most you can tow? Polk starts with the hitch receiver and then covers the hitch ball, ball mount, weight distribution hitches, sway controls, safety chains and brake controls. After a thorough explanation of each component he demonstrates how to properly hitch and unhitch the trailer to the tow vehicle. Towing the Trailer: Polk starts with pre-departure safety checks to include properly adjusting your mirrors. Then he demonstrates towing, making turns, towing speeds, stopping, passing vehicles, upgrades, downgrades and much more. Perhaps one of the biggest concerns he addresses is what causes a trailer to sway and what you can do to control it! After the towing segment Polk wraps up the video by teaching you two easy methods to back the trailer. He calls them the assisted and unassisted methods. With a little practice you’ll be backing like a pro. After watching this video, what seemed to be intimidating at one time, is now just a matter of doing things properly. This video will make you feel 100% better about safely towing your trailer. 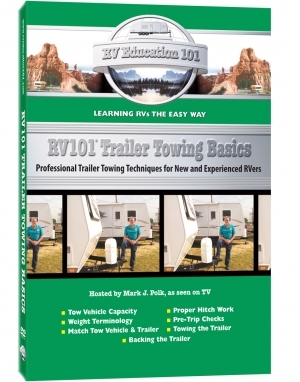 Trailer Towing Basics is your complete guide to safe and proper trailer towing for beginners and experienced RVers. The video walks you through the entire trailer towing experience step-by-step. 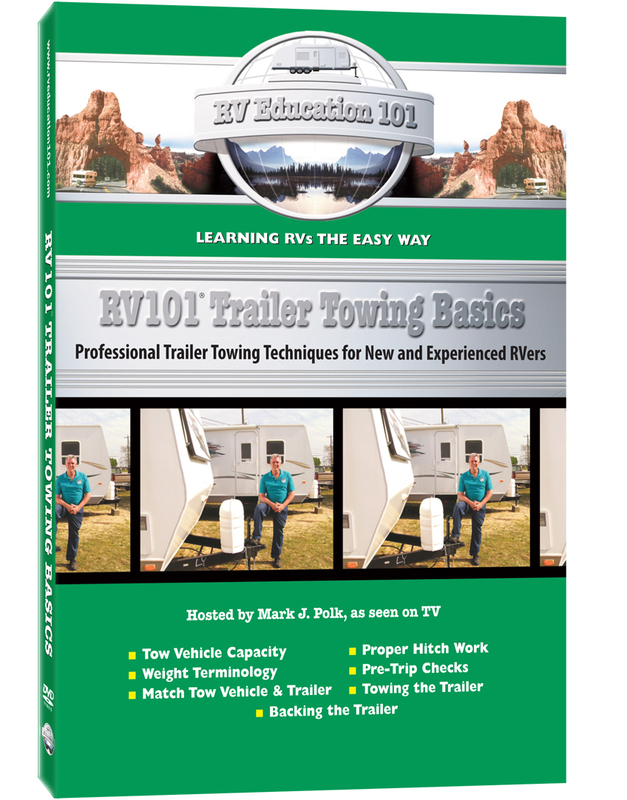 In the video host Mark Polk, with RV Education 101, demonstrates how to safely and properly match the tow vehicle to the trailer, proper hitch work and trailer towing techniques. After you understand the trailer towing basics Mark provides you with all the tools you need to become proficient at towing and backing a travel trailer. This video is a must have for anyone considering purchasing and towing a travel trailer. There is also a PDF download that explains all of the weight terminology you will need to be familiar with. NOTE* The delivery of the RV Education 101® video files below include the most universal file which is an MP4 file to be downloaded to your computer. These videos will play on Apple devices IF you have a windows program, or a converter that converts to an mov file. You can also sync the MP4 file with your Itunes account. The below downloads WILL NOT WORK on an Ipad Air and we can not guarantee it will work on any Mac or Apple device.